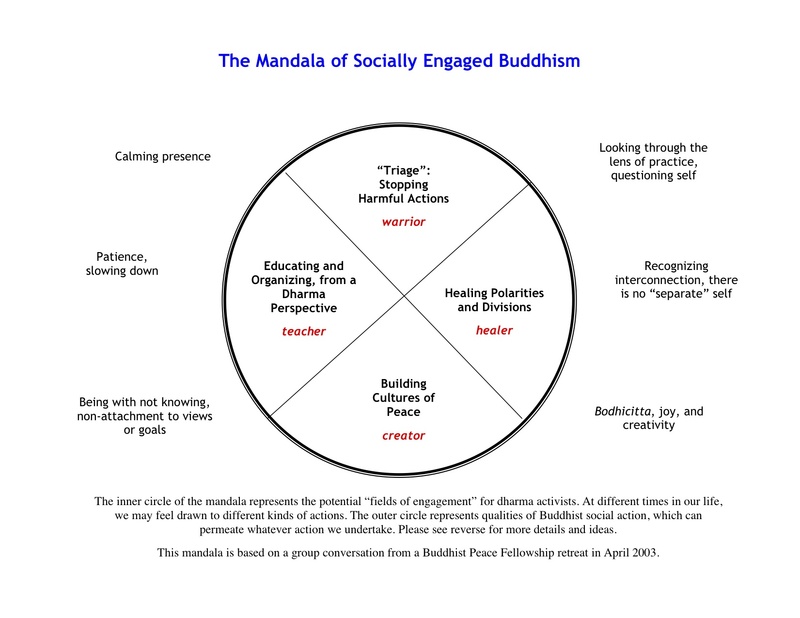 I’ve referred to the “Mandala of Socially Engaged Buddhism” a couple of time in previous posts on this blog, and I’ve finally dug it up to share it with all of you. If you click on the graphic above, it should open up in a separate window with slightly higher resolution. Some background on this mandala: It was inspired by a gathering of a number of Buddhist Peace Fellowship chapter leaders in 2003. Everyone shared the kinds of activities that their chapters had organized, and (just as importantly) how they organized these events, what qualities were important for them in the process of organizing. I was the designated note-taker at this meeting. After digesting all I had heard that day, this mandala is what came to me as a way to summarize what everyone had shared. I realized that the types of activities or events seemed to cluster into four categories (the four quadrants of the circle above), and then I included the six qualities that people consistently named as important parts of the process around the outside of the circle. Later on, I added an archetype into each of the quadrants (e.g. “the healer”) as that was an interesting dimension to play with. •	Designing actions intended to shift power and encouraging others to participate in the change process –provide contact information for legislators, suggested letters to write, invitations to vigils, etc. The mandala was also influenced by Joanna Macy’s writings about the “Great Turning.” In fact, you’ll see some parallels in this mandala. Macy says that in order for us to navigate the transition from an industrial society to a life-sustaining society, three actions are needed: 1) Holding Actions (similar to the “Triage” in this mandala), 2) Alternative Structures and Analyses (similar to the “Building Cultures of Peace”) and a 3) Shift in Consciousness and Spiritual Awakening (not really a separate part of this mandala, but woven in throughout). One of the most important points about this mandala is that it is completely interconnected. All four quadrants of action are equally necessary, equally valuable. No one’s work is more important than someone else. Over the years, this mandala has been a very helpful tool to work with, both with individuals and groups, as we think through how we’ve engaged with social, political, and environmental issues. I’m wondering what thoughts you have about this mandala. Do you notice that your activism has tended to be in one of these quadrants more than others? Do you feel out of balance in any way as you engage with the world? 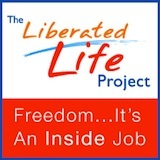 Are the six qualities present in your life and activism? What else might be missing from the mandala? I consider this mandala a work in progress, so I’d love to hear your feedback on it and any ways that you find it useful. Posted in Ruminations... and tagged Buddhist Peace Fellowship, Joanna Macy. Bookmark the permalink. You really are on a roll with all these great visuals of late on your blog! It strikes me that this mandala of yours can also apply to the smaller world of our various interpersonal relationships. A great to-be guide, neatly packaged for the visually inclined folks like myself. Thank you Maia, and may you be well, and at peace! Marguerite — thank you for your thoughts. Yes, I agree that the mandala can be just as applicable at the mico-level as well. And yes, visuals can help a lot! I am my psychiatric survivor collegues are engaged in challanging the dominant medical paradigm of psychiatry. this paradigm consistenty produces learned helplessness and learned hopelessness with its bleak and inaccurate prognoses of what they label serious and persistent mental illness. the prognoses are not supported by scientific evidence. For example in 13 studies from 13 to 37 years the average recovery rate is 63% with a range from 46 to 84%. the lowest recovery rate used marriage as a criterion for recovery as the researcher did not believe recovery from schizophrenia happened. this is most odd. other methodological oddities make it a suspect study. The Kraepelin hypothesis was formulated in Germany as Hilter was coming to power and was used by the psychiatric establishment to try to eliminate us ( i have this label). What is the Kraepelin hypothesis? that schizophrenia and other “mental illnesses” are biologically based degenerative diseases. it is simply put not supported. but the money and power of Big Pharm keep it alive. there are successful non drug and low dose drug approaches like The Windhorse Project a Tibetan Buddhist based approach and others like Soteria Houses and Open Dialogue in Finland. Soteria House has been terribly mis represented, but has good outcomes even in acute psychosis. and none of the terrible side effects associated with the drug approach like metabolic syndrome which greatly contributes to the death 25 years younger of people labelled and “treated”. We engage in all 4 quadrants. We do have an active healing practice, many of us. we are wounded healers. we have healed ourselves (often together) and heal our labelled brothers and sisters. google “ed knight recovery” for a little of my work. Will Hall and I are founding the Psychosis Dharma Community to heal the discrimination in mental systems and the buddhist community parts of which deny us the use of meditation to heal out of the gross misperception that we will abreact. careful preparation is needed before doing a sessein but this is often done. sometimes in places which exclude us without telling the person in charge. many of us are hidden in your communities. We wish to be open and public about our labels. some places accept this but many do not. we practice also for the healing of those who exclude us out of fear. Direct healing seems absent in the mandala. Thank you for your comment. I hadn’t thought of it that way (the absence of direct healing) — I guess because my assumption is that we all have to do a lot of healing within ourselves before/at the same time that we may offer a healing presence to others. But thank you for making that explicit.